This exotic hand cannon is earned through completing a quest line obtainable from Gambit. Defeat the Ascendant Primeval Servitor (could randomly summon instead of usual Primeval). You will receive the Seething Heart quest drops after killing the Servitor. City of Secrets: Defeat 25 Taken Bosses or mini bosses in the Dreaming City. The Corrupted: Complete the mission variant of The Corrupted Strike. Business as Usual: Win Gambit matches and deposit Motes. Lost Motes subtract x2. You’ll have to deposit about 500 Motes. Lights Out: Kill 25 opposing Guardians. Get 4 kills in 1 invasion or have a teammate invade the opposing team and get 4 kills Guardian kills 3 times. 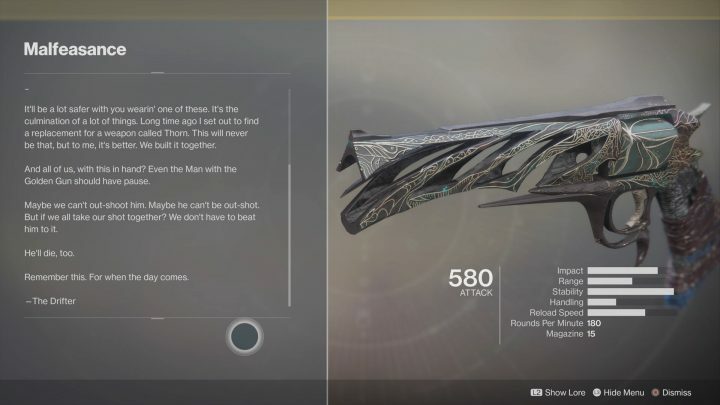 Visit the Drifter to receive your exotic hand cannon! Exotic Perk: Explosive Shadow – Shoot tainted slugs that burrow into the enemy. Stacking enough slugs causes them all to explode.